T.E.A.M. 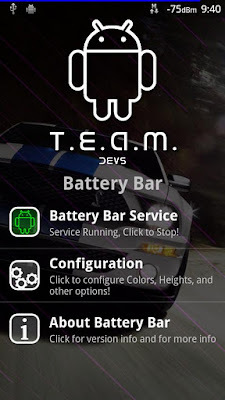 Battery Bar - The simple way to see your battery level ~ Android Forever! Battery widgets are pretty, and pretty convenient, true, but nothing can beat the ease and convenience of this app when it comes to quickly spotting your battery level. The app placed a simple bar along the top or bottom of your screen. Check it out! T.E.A.M. Battery Bar is FREE on the Android Market!